Retractable Tape Barrier w/Custom Printing - Up to 3 Colours! Custom Barrier Tape Advertises to Customers in a Queue! Looking to replace your existing retractable barrier tape? This crowd control system is designed to work with some of our stanchions and makes it easy to change out existing belts that have become worn over time. 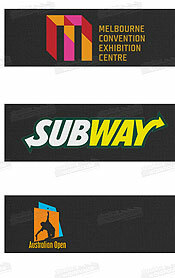 A customer barrier belt is a great way to improve marketing at your location without adding additional signage. In most cases, floor space is at a premium in locations like retail stores, shopping centres, exhibition halls, museums, cinemas and information centres. Striking the balance between offering visitors an unobstructed walking path whilst still showing plenty of merchandise or exhibits can be hard, and that's why using this style of marketing to upgrade your existing belts is so great. 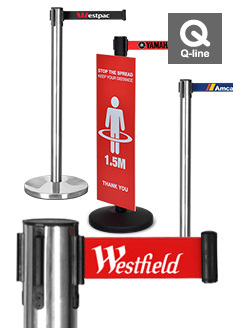 You already have space allocated for creating a queue or sectioning off areas, and these belt systems can replace your existing belts with logos and advertising displayed without taking up any additional space. Dual-sided printing on the retractable barrier belt helps maximise exposure to visitors as well, all without taking up heaps of space in your location. There are different printing options depending on how many colours your designs have, with all options using digital printing to ensure vivid colours and an accurate representation of your graphics. 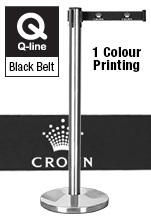 Choose from 1, 2, or 3 colour printing options with your logo able to easily be seen against the woven nylon belts. 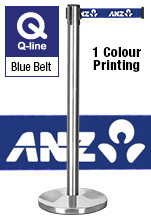 You may also purchase the belts without any printing just as a replacement for barriers that are no longer working or need refreshing, with grey, blue, black & red options available. 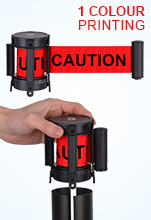 These stanchion belts have a 4-way adapter that ensure ease of use when creating a queue or sectioning off an area at your business. Attaching the display to other crowd control stanchions or wall mounted clips is easy, and each belt is 1.8m long to extend out with ease and reach your post. 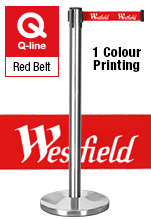 The end of the belt has a tamper-proof clip that helps keep the display in place during use in heavily-trafficked public areas, helping to ensure your queue or section off area remains properly in place during business. Switching out the cassette from your existing barrier belt is easy as well, with only simple tools needed to change your stanchion quickly and easily. This style of crowd contorl system is popular due to it's easy to use nature and great return on investment. 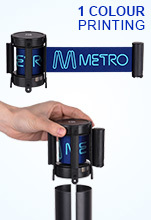 Order today to create an effective marketing campaign at your business whilst still offering great queue management or sectioning off important areas of your location! Click here to see the huge array of products we have available in our online catalogue to help you sell merchandise and promote your business in style. Our wide selection of products is full of low-cost items that are made of high-quality material in order to be long-lasting. Each product has been thoroughly inspected prior to being offer for sale, with the quality assurance team ensuring that only top quality goods can make their way into the hands of our customers. We are constantly looking for new items to sell our growing customer base in order to keep you ahead of the competition using the latest in technologies, trends, & styles to keep your company ahead of the curve. 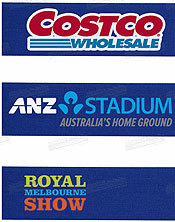 With over 25 years experience in the business, Slimline Warehouse has made a name for ourselves by offering a great selection of POP, POS, retail, & exhibition products that last for years to come. 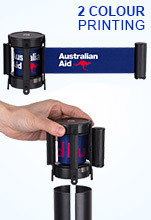 The majority of our products will despatch same day when purchased by 1pm EST to anywhere in Australia when in stock. Order for your company today in Adelaide, Hobart, Canberra, Melbourne, Geelong, Sydney, Brisbane, Townsville, Cairns, Newcastle, Wollongong, Alice Springs, Darwin, Perth, & Toowoomba!